The movie below is supplementary to a paper entitled Locally Adapted Projections to Reduce Panorama Distortions presented at the Eurographics Symposium on Rendering 2009. The paper introduces locally-adapted projections for panoramic images. 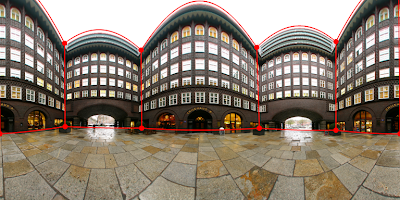 Defined as a continuous projection surface consisting of both near-planar and curved parts the simple and intuitive user interface allows the specification of regions of interest to be mapped to the near-planar parts, thereby reducing bending artifacts. The authors demonstrate the effectiveness of their approach on a variety of panoramic and wide angle images, including both indoor and outdoor scenes. It should however be noted that the ideas behind the paper are subject to dispute with the idea and proof of concept linked to the work of Helmut Dersch. Helmut is a well known innovator in the field and as he states omitting acknowledgments and references in high-level academic papers for sourced data, experiments or techniques is not acceptable. We concur completely with this view having seen various of our own labs work plagiarised over the years and action taken. The link to the full paper has been removed in light of the update to the post. thats a useful proces! hope it finds its way to a product or a service. So is this available as a piece of software or plugin for AutoPano or PTGUI?